The World Economic Forum [WEF] released its Global Competitiveness Report (2008) when the global economy is weathering multiple shocks. The Report aims to enhance our understanding of the key factors determining economic growth, and to explain the extent of a nations level of competitiveness ability to provide rising prosperity to its citizens. The current report, the flagship publication of WEF Global Competitiveness Network, includes a comprehensive analysis of 134 countries using hard data from a variety of sources and survey data drawn from its Executive Opinion Surveys. While Survey data provide qualitative information, hard data provide an objective measure of a quantity. An Appendix (pp. 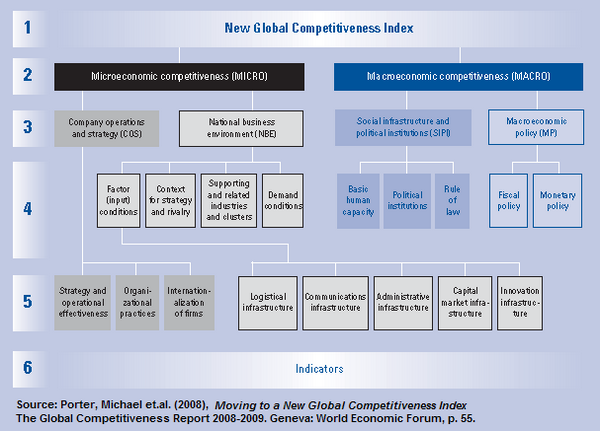 39-41) describes the exact composition of the Global Competitiveness Index [GCI] and technical details of its construction. Sala-i-Martin, et.al. (2008) defines competitiveness as the set of institutions, policies, and factors that determine the countrys level of productivity. Competition involves static and dynamic components grouped into open-ended, yet interrelated and mutually reinforcing, 12 pillars of economic competitiveness. Different pillars affect different countries differently. Respective sets of pillars, shown in the figure, are key factors to corresponding stages of development. Factor-driven economies compete based on their factor endowments, primarily unskilled labor and natural resources. When wages rise, countries move into the Efficiency-driven stage and compete based on more efficient production processes and increased product quality. Finally, in the Innovation-driven stage, competition is supported with new and unique products to sustain higher wages and the associated standard of living. The concept of stages of development is appropriately integrated into the Index by attributing higher relative weights to those pillars that are relatively more relevant for a country given its particular stage of development. The pillars are organized into three subindexes, each critical to a particular stage of development. The basic requirements subindex groups those pillars most critical for countries in the factor-driven stage. 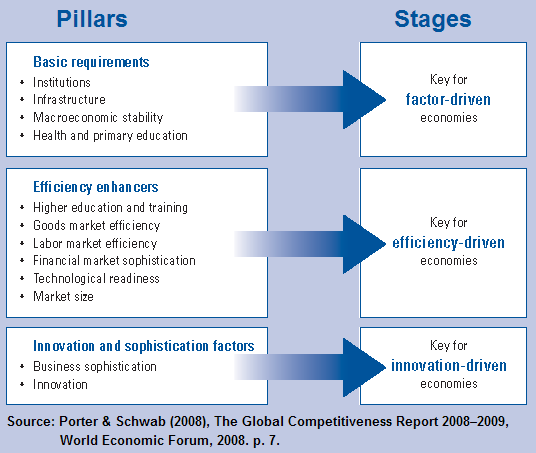 The efficiency enhancers subindex includes those pillars critical for countries in the efficiency-driven stage. The innovation and sophistication factors subindex includes the pillars critical to countries in the innovation-driven stage. First pillar: Institutions form the framework within which individuals, firms, and governments interact to generate income and wealth in the economy. Second pillar: Infrastructure ensures the effective functioning, the location and kinds of activities or sectors of the economy. Third pillar: Macroeconomic stability alone cannot increase the productivity of a nation, it is also recognized that macroeconomic disarray harms the economy. Fourth pillar: Health and primary education of the workforce is vital to the latters efficiency. Fifth pillar: Higher education and training measures the workers adaptability to their changing environment, and crucial for raising the value chain beyond simple processes and products. Sixth pillar: Goods market efficiency ensures the production of the right mix of products and services given supply-and-demand conditions, and the effective trade of these goods. Seventh pillar: Labor market efficiency and flexibility ensure workers allocation to their most efficient economic use and are provided with incentives to give their best effort in their jobs. Eighth pillar: Financial market sophistication allocates the resources saved by a nations citizens as well as those entering the economy from abroad to their most productive uses. Ninth pillar: Technological readiness measures the economys agility in adopting existing technologies to enhance its industrial productivity and commercial transactions. Tenth pillar: Market size allows firms to exploit economies of scale; and with globalized and open trade, international markets have become a substitute for domestic markets. Eleventh pillar: Business sophistication, the quality of a countrys overall business networks and of individual firms operations and strategies, is conducive to higher efficiency in the production of goods and services. Twelfth pillar: Technical Innovation is a must in the frontiers of knowledge, and in design and development of cutting-edge products and processes to maintain a competitive edge. The aim of the New GCI is to reveal the underlying causes of productivity using three overall building blocks of the framework: endowments, macroeconomic competitiveness, and microeconomic competitiveness. Disclaimer: The posts on this site do not necessarily represent any organization’s positions, strategies or opinions; and unless otherwise expressly stated, are licensed under a Creative Commons Attribution-Noncommercial-No Derivative Works 3.0 License.